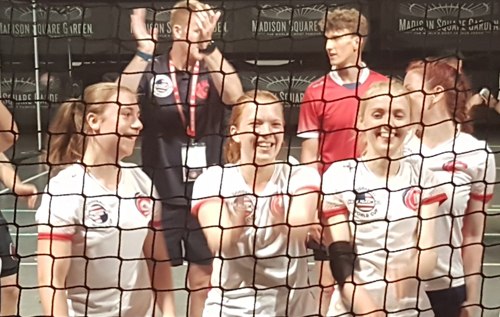 Three former students of Reepham High School & College won gold medals at the Dodgeball World Cup held in New York in August. Abbie Gower of Reepham and Holly Edmonds and Lauren Hems, both of Briston, started playing the sport of dodgeball while studying at the school, where PE teacher Katie Lake is one of the coaches for the England Lions dodgeball team. Now all aged 20 and at university, the trio made the England squad and travelled to New York at the end of July, beating Austria in the final at Madison Square Garden. 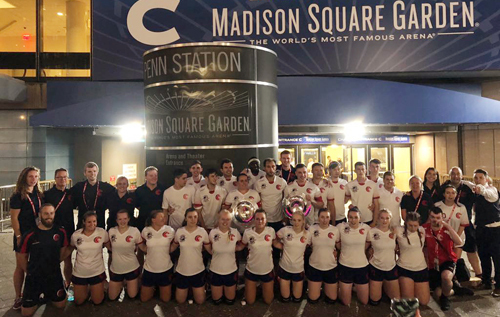 The group stages were played on Friday 3 August at New York’s, Basketball City, where England Lions women beat every team they played, including Canada and host nation the USA, progressing to the quarter finals on Saturday at the top of their group. Friday’s games finished late and Saturday’s finals started early, but they were now in Madison Square Garden, arguably the world’s most famous sporting and entertainment arena, where the excitement and anticipation were palpable (writes Lynne Gower). England Lions women’s team comfortably dispatched Singapore 27–1 to progress to the semi-final, where they met Hong Kong. This game was a little closer, but England came through to win 18–6. The women waited to see whether they would face Austria or Australia in the final, who were still playing on court 2. They were hoping for Australia, as England had narrowly missed out on gold to Austria at the 2017 European Championships. However, Austria won and the final was set – England would meet Austria again. The game could not have been closer. England started stronger and went 4–0 up; then Austria levelled at 4-4. England pulled away again and were 10–4 up. The next two games went Austria’s way and they came back to 10–8. The clock was ticking and England took the last game, just before the whistle, with the final score 12–8 to England, who became world champions. Ms Hems also played for the mixed team that also won gold, beating Scotland in the final, with the England men’s team coming fourth, losing in overtime to Malaysia in a dramatic semi-final. Next up for the Lions is the 2018 European Championships in Italy in October.